A warm welcome awaits you when you visit one of our meetings. There are no reserved seats so you can feel free to sit wherever you feel comfortable. We worship God by singing hymns and choruses which are selected by someone different each week. The words are projected onto a screen so there is no need to look for a hymn book or song sheets. On arrival you will be given an order of service so you will know what happens when. Prayers are offered and if there is something or someone you would like us to include in the prayers please let us know when you arrive. The main focus of our meeting is to remember the sacrifice that Jesus Christ gave for us by dying on the cross at Calvary. We proclaim his death, burial and resurrection together by the taking of bread and wine in communion. As we look back on what he did for us we also look forward to his return whenever that may be. This is a celebration reserved for those who have committed their life to Christ in faith by repentance of their sin and have put the past behind them by immersion in water. So please do not feel awkward by not participating if you have not yet come to faith in Jesus Christ. We do take the opportunity to give financially but do not ask visitors to feel they have to contribute. We have decided to support various works in this country and around the world, we also need to pay the bills locally. So as our guest this is not your responsibility and we do not want you to feel you must give when visiting. A talk will be given based on a passage of the Bible or a topic which needs a biblical response. 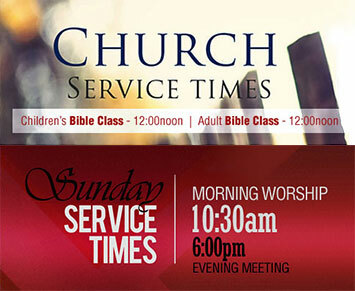 At the close of the worship service there will be a few announcements and a then a time for tea and coffee. After this there are Bible study groups for all ages from children to adults. We are an independent, self-governing local congregation who earnestly desires to follow our Saviour Jesus Christ. Although we have no organization larger than the local church with no world headquarters, we have thousands of sister congregations all over the world. If you are not in Northampton, contact us and we can let you know if there is a congregation near you. There is no man or group of men, who legislate doctrine for the church. We have no one to answer to but Christ. He is the head of the church which leaves no room for any human head. Each congregation will seek out from within those who are spiritually mature and appoint them to be elders, shepherds to oversee the well-being of that congregation of believers. Looking out for every one’s spiritual welfare but again using the Bible as their guide. There is no inter-congregational organization, but rather independent congregations in different locations with Christ as Lord and Master. However we thrive on working together to help one another in whatever way might be needed and join together to spread the good news of Jesus Christ. We have no human creed or catechism to enforce unity, our unifying force is that each congregation uses the Bible without creeds. 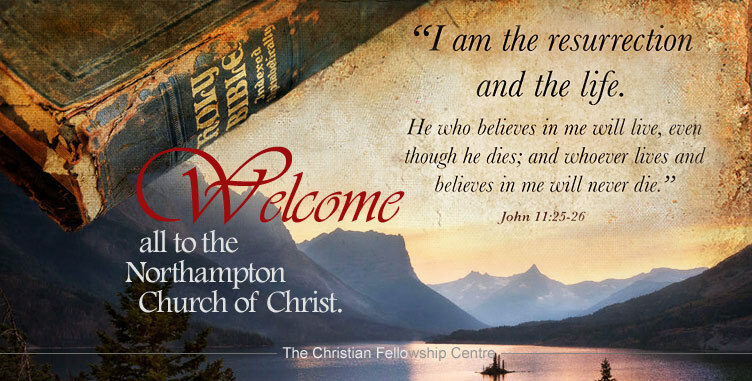 We are a church of Christ, a term we find in the New Testament. It is more descriptive than a name. We are called out as a group to be Christs’. We are basically a local branch of a global organisation who recognises each other because we do Bible things the way the Bible teaches us to. God sent His Son Jesus Christ into the world to give His life to save us from our sin. Out of our love for what He has done we willingly follow Him, showing our love by obedience to His Word. 1980 was the year that the church in Northampton, really started to take off numerically. There had been a congregation for a short while prior to then,which had been started by American missionaries but which comprised of only a handful of members. And so it was, in this first summer of the new decade, that help from other congregations was enlisted and a gospel outreach campaign was arranged. Leaflets were distributed and men and women of the church also went door-knocking, offering personal studies. At this time the congregation was meeting in a rented hall, but during the campaign they were able to secure the use of a conference room in The Grand Hotel, which, then, was a fairly prestigious establishment, right in the centre of town. It was here, in the hotel, that some 80 baptisms took place, using a chest freezer, would you believe! Consequently, this small congregation of just a few, suddenly became one with a membership of eighty plus. Over the following months, much had to be put in place, to ensure that these new Christian`s would receive good teaching and a proper grounding in sound bible doctrine. Soon, a full time British evangelist, Trevor Williams was appointed to serve the church in these vital, formative years. These were exiting days as the congregation was filled with souls who were thrilled by a new -found faith. Enthusiasm was bursting forth everywhere. Now, the meetings were taking place in a local school hall, but around the middle of 1981, the idea was presented, that a special fund be started, with the aim of buying a building. At first this seemed a very tall order indeed, but the idea was accepted and agreed. Trevor visited The States, to help raise some of the funds and generous donations ensued. British churches too, helped the cause,but still, much of the finance had to found by Northampton itself. The special fund grew, and also trustees were appointed, in order to obtain a mortgage,should the right place become available. Premises were viewed, and one, which was close to the town centre, seemed to tick all the boxes. Hopes were raised that this could be the new home for the congregation, but for various reasons, it was not to be and there was huge disappointment when things could not proceed. But God had something better in store. Soon land became available from the council at a good price and it was decided that a brand new structure should be erected. The bank agreed the mortgage and soon the builders began their work, but to keep down the cost, a considerable amount was done by the members themselves. Added to this, one of the members was an architect and all the building plans were produced at no cost to the church. During 1982, the congregation moved to Ecton Brook Community Centre, which was much closer to the chosen site than the school hall previously used. Finally, in June of 1984, the “Christian Fellowship Centre” was ready for use. Now the congregation had a much fuller sense of being established in the town and everyone looked forward with great expectation, as to what was next. So much had happened in these first few years. The Christians had hardly had time to draw breath. The coming years would bring new challenges, but for now, this first phase brought great satisfaction. Those, whose foresight and work in starting things off in the early days, were to be thanked. Many had played a part in getting things to where they were now. The Lord had shown his blessing. Like so many people, we want to grow to know God more fully and to enjoy the abundant life he offers through Jesus, his Son. We certainly do not profess to have all of the answers, nor do we claim to be alone in our pursuit of truth, but we do have a desire to serve and to share the good news of Jesus with others in whatever way we are able. The assemblies of which we are a part are historically known simply as "Churches of Christ". The term was never meant to be used in a sectarian sense but is purely intended to denote our desire to belong to none other than Christ. The congregation is a registered charity under the name of 'Northampton Church of Christ' (charity number 287419). We are not to be confused with any newly formed sects identified in a similar fashion. We are part of a world-wide fellowship of believers who apply the simple principles and teaching of the Scriptures to our lives today. We really want to be nothing more and nothing less than Christians. It is evident that much of the confusion in the religious world stems from the acceptance of human creeds and authorities. We want to lay these aside, and we plead for the unity of all believers on the basis of the scriptures alone. We are not against "tradition" simply for the sake of it, it's just that we regard the Bible (both Old and New Testaments) as being the only reliable and all-sufficient word of God to mankind. Jesus is our only Lord. In every area of our lives we want to listen to him as we seek to live as God has directed in the Scriptures. God the Father created the earth and everything in and around it. He called what He created "good". Because of sin, man was separated from God and had no hope. Because of this, through the miraculous virgin birth, God sent His Son - Jesus Christ - to die for the forgiveness of our sins so that we might have hope. After dying a cruel death to save all people, Jesus Christ rose on the third day, ascended into Heaven, and is now at the right hand of God. 4. Through hearing (Rom. 10:17), belief (Jn. 3:16), repentance (Acts 2:28), confession (Rom. 10:9), and baptism (Acts 2:38), we can be saved! 5. The English word "baptise" comes originally from the Greek word "baptizo" meaning literally "to dunk". The Bible is the inspired, perfect Word of God and is to be used for teaching, exhortation, and reproof. At Northampton Church of Christ we you can expect to share in an abundance of warmth, love, and compassion that Christ has shown to us. We will sincerely appreciate your worshipping with us. We pray that the worship will bless and encourage you. We also hope that you will want to return. Perhaps you are not in a congregation of the Church of Christ. 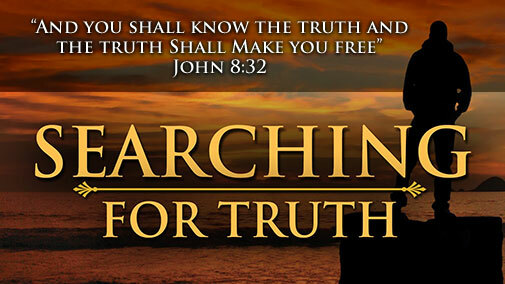 Thought-provoking and engaging sermons based on the Bible. A place to belong. You can grow, laugh, and serve in a warm, loving and nurturing evironment among fellow believers. A chance to make a difference. God created us each with special gifts and abilities that we can each use to change lives in your community and the world. A way to grow. We want to equip you with the tools to develop as a fully devoted follower of Christ. As an individual, family, and part of our Church of Christ congregation. A place just for kids. Each weekend kids learn the truth about who God is and who they are because of Him through age-specific lessons, small groups, and trusted adult leadership. Prayer Meetings. There are prayer meetings held each Sunday after Service and there are also house group bible classes during the week. Fellowship Meals. In months of the year where there is a fifth Sunday, we will have a guest speaker and a fellowship meal. Men's Day. Guest speakers, studying of scriptures, sharing of great food and fellowship. Women's Day. Guest speakers, studying of scriptures, sharing of great food and fellowship. Youth Retreat. Two retreats are held over summer vacation, one for teens (+13), and another for children 8 to 13 years of age. United Kindgom, and the world. oversight of its elders, a Church of Christ radio with a UK flavour, programs would include Live Talk shows, as well as Sermons from some of the greats. We aim to bring you the latest information related to the church events in the UK, as well as live broadcasts, so stay tuned.